Ryn has been taken to the police station - by two cops. Ok, I want to see the deleted scene where 8 or 9 police all have their limbs ripped off OR Ryn gets shot - because I don’t see her reacting to the THREAT of a gun being pulled on her (because does she even know what a gun is?) and I fail to see how any amount of cops could restrain her without injury given the whole super strength and hyper aggression. Sheriff Bishop interviews her, apparently taking her obvious cognitive and communication difficulties to waving her right to a lawyer and Sheriff Bishop needs a swift kick in the yin-yangs for this one. Either he thinks she’s impaired by drugs (his obvious theory) or he is mentally disabled either way she at least needs a competency check not questioning for murder. Maddie realises that they need to tell her dad the truth especially since Ben has gone out in the boat with Xander and Ryn is worried that Donna will murder them all as is her plan. First we have Maddie drawing upon her and her dad’s Native American heritage to tell stories about shapeshifting people. And they even have panpipes and drums behind it - really? Oh the cringe the cringe. Thank gods her dad doesn’t just decide to believe in shapeshifters because he’s Native American - so Maddie dumps some salt water on Ryn to make her arm turn scaly. I think terrible skin conditions are more convincing. Of course “I wasn’t covering for a murderer, I was covering for a murderous alien sea-creature who responds with violence in the first instance, is super strong, can mind control people and also I may be on the hit side of a military conspiracy” may not necessarily be better? Cal and Chris are along for the ride even though they’re both on record with not really wanting to be or trusting Ben for that matter. Things get a little complicated when Xander’s dad wakes up - he’s been staying on the boat due to some marital difficulty and Xander didn’t notice because, damn man, you need to call your mother more often! Eventually Ben convinces Xander senior (I’m not looking up his name, he’s not going to be around much longer) to do it anywhere because government bad or something. 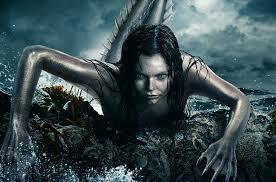 Personally I think people really need to stop trying to fight mermaids on the water without lots of machine guns.